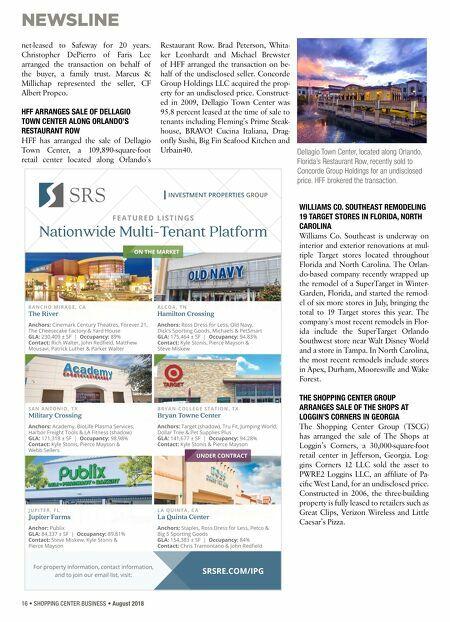 16 • SHOPPING CENTER BUSINESS • August 2018 NEWSLINE net-leased to Safeway for 20 years. Christopher DePierro of Faris Lee arranged the transaction on behalf of the buyer, a family trust. 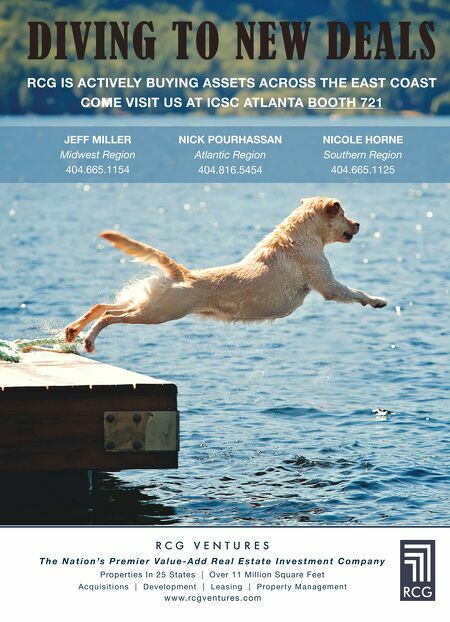 Marcus & Millichap represented the seller, CF Albert Propco. HFF ARRANGES SALE OF DELLAGIO TOWN CENTER ALONG ORLANDO'S RESTAURANT ROW HFF has arranged the sale of Dellagio Town Center, a 109,890-square-foot retail center located along Orlando's Restaurant Row. Brad Peterson, Whita- ker Leonhardt and Michael Brewster of HFF arranged the transaction on be- half of the undisclosed seller. Concorde Group Holdings LLC acquired the prop- erty for an undisclosed price. Construct- ed in 2009, Dellagio Town Center was 95.8 percent leased at the time of sale to tenants including Fleming's Prime Steak- house, BRAVO! Cucina Italiana, Drag- onfly Sushi, Big Fin Seafood Kitchen and Urbain40. WILLIAMS CO. SOUTHEAST REMODELING 19 TARGET STORES IN FLORIDA, NORTH CAROLINA Williams Co. Southeast is underway on interior and exterior renovations at mul- tiple Target stores located throughout Florida and North Carolina. The Orlan- do-based company recently wrapped up the remodel of a SuperTarget in Winter- Garden, Florida, and started the remod- el of six more stores in July, bringing the total to 19 Target stores this year. The company's most recent remodels in Flor- ida include the SuperTarget Orlando Southwest store near Walt Disney World and a store in Tampa. In North Carolina, the most recent remodels include stores in Apex, Durham, Mooresville and Wake Forest. THE SHOPPING CENTER GROUP ARRANGES SALE OF THE SHOPS AT LOGGIN'S CORNERS IN GEORGIA The Shopping Center Group (TSCG) has arranged the sale of The Shops at Loggin's Corners, a 30,000-square-foot retail center in Jefferson, Georgia. Log- gins Corners 12 LLC sold the asset to PWRE2 Loggins LLC, an affiliate of Pa- cific West Land, for an undisclosed price. Constructed in 2006, the three-building property is fully leased to retailers such as Great Clips, Verizon Wireless and Little Caesar's Pizza. Dellagio Town Center, located along Orlando, Florida's Restaurant Row, recently sold to Concorde Group Holdings for an undisclosed price. HFF brokered the transaction.